So I’m running out of space on this website. In fact, my dashboard tells me I have already done so. I don’t have a premium package anymore, as I downgraded my services last year when I really wasn’t sure what would happen to this blog. That means no new pictures until I can delete some old posts, which I am slowly doing. I’d like to keep the posts I actually wrote, and delete the links to books I enjoyed, or the Friday cartoons. Re-read them if you want, because some posts from June of 2012 will be disappearing soon. I promised I would talk about notebooks this week, but before I do that I want to talk about a beautiful book my sister sent me for Christmas: The Lost Words by Robert Macfarlane, illustrated by Jackie Morris. This heavy and huge book is a picture book, a self-proclaimed spell book, of magical words that have vanished from the language of children. Essentially it is a collection of poems about certain words, like acorn, heather, raven, and wren, to name a few. The poems are glorious and definitely meant to be read aloud. But the real wonder of this book are the illustrations. Jackie Morris brings the natural world to life , interspersed with beautiful floating alphabets in whimsical fonts. I hadn’t heard about it at all but my sister is much more in tune with new titles and the latest publishing marvels. So it was the perfect surprise on Christmas day. It is very special, as is the sister who gave it to me. She continues to surprise and delight and support me, and I only hope I do the same for her. I am also using one of my custom Bookblock Original notebooks to organize my blog posts. I jot down ideas for each week as I think of them, with my overall aim to have some sort of coherent plan for the year. As for my planner, I have HUGE news!!! In December of 2016 you may recall I wrote a blog post about my plans for 2017, to use a Leuchtturm 1917 Jottbook as a bullet journal planner. And I used it all through 2017! And I’m still using it! I can’t believe I actually stuck with a planner for over a year. Very proud of myself. I don’t have a lot of appointments/tasks to keep track of, but it works for me. Who knew the simplest system would work the best? I still love my Filofax binders but just can’t bear to carry them around with me. My bullet journal weighs nothing and I don’t feel bad if I don’t look at it for a couple of days, because there are no wasted pages. Ryder Carroll is a brilliant man. I’ve heard he has introduced a Bullet Journal app to support the analog journal but I haven’t tried it out yet. And here’s another piece of huge news (lowercase huge): I have added a log book to my journal system. I got the idea from Austin Kleon from his post On Keeping a Logbook. My writing is long-winded (bless you reader if you’ve made it this far!) and often I find myself running out of time for my long journal pieces. Right now I’m still trying to write a coherent journal entry about Christmas – the joys of getting together with friends and family, tempered by the power being unable to stay on – and then something amazing will happen in my day that I just have to write about (saw David Letterman’s new show for NetFlix, My Next Guest. The guest was Barack Obama and what he said about voter apathy really got my cylinders firing). In the past I would tear into a new journal or have two, three or four journals on the go. But I may have solved this with a logbook: I can at least write down a brief description of what I want to write about later. This has the obvious benefit of prompting me to remember it and empties my brain so I can focus on other things. I love Austin Kleon’s newsletter; I almost always have something to copy into my journal, or to send to David, as Austin has an eclectic taste in music. If you haven’t already done so, check him out. Oh I almost forgot – the notebook I am using as my logbook is the Colouring Notebook. Today is January 14 and I haven’t missed a day. They say it takes two weeks to form a habit so this bodes well! Hope you all had a great week. Happy journaling. Last Monday I wrote about my struggle to choose a new journal after finishing my Franklin Christoph notebook. I was torn between my William Hannah Kingfisher and a large Eccolo journal I bought at Staples. The truth is I couldn’t decide so I chose both of them! Let me explain. I LOVE the William Hannah notebook and it will become my daily journal. 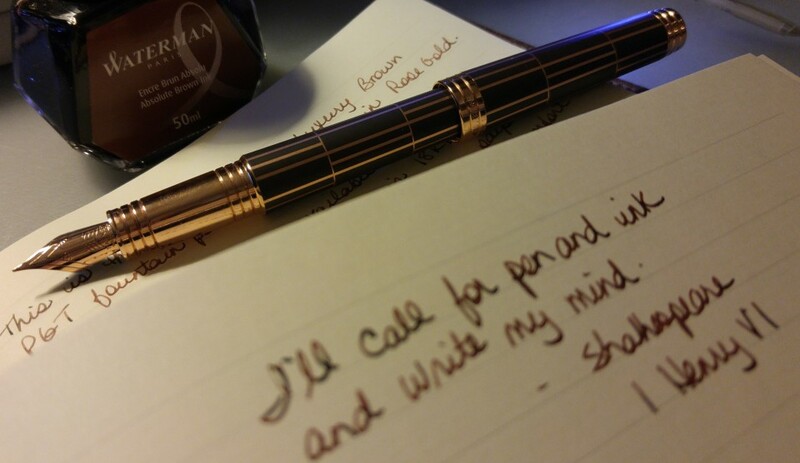 The paper is amazing for fountain pens and the notebook just makes me happy. BUT – I have a love of pasting things into my notebooks and I wanted the Eccolo (pictured above) because it wasn’t so precious, and it was larger than the William Hannah, so I can stick all kinds of stuff in it without feeling I’m ruining the pages. So both of them have been brought into my rotation. Here you can see the Eccolo. I’ve pasted pictures of old desks and tea sets from old issues of Victoria magazine. You can just see my journal entry peeking out. It’s quite personal so I felt the need to put the magazine cutting on top of it. Here’s another page from the Eccolo. It’s more rough and tumble than the William Hannah but my heart really belongs to the William Hannah. I couldn’t show the pages because they are ultra personal. But trust me, that journal now goes everywhere with me. I thought you might want to see more of the desk these journals are sitting on. This is my rolltop desk, which I have owned for more than a decade. In my previous home it lived in the living room and was rarely used. Now in my present home I have a much larger office and I can use both of my desks. You’ve seen my black desk in a few posts, and my computer and extra monitor live on it. When I work from home I use the black desk. It’s just a simple desk with a very large, flat top, perfect for typing. However my rolltop desk is perfect for writing and I am so happy I can use it in my new setup. I took this photo without too much thought, apparently, as I cut off the drawer that is underneath the lock. When my office is completely set up I will take a better picture. For now, this is the top of the rolltop desk. It is made out of oak and is a rich brown colour. The lock works and miraculously I still have the keys! I have a banker’s lamp on the top (thank you Christine!) and I try to keep it relatively clear of stuff. Right now I have my letter box, a few books and a card file stationery box. You first saw this desk in my post about my glass pen. Here is the main part of the desk. I have a white desk blotter to protect the writing surface. The banker’s lamp gives a lot of light but the cubby holes can be a little dark so I added the fairy lights and the candle holder (with a battery operated candle) to further illuminate the area. I have my glass inkwell on the left, with some small notebooks just above it. I keep my Harrod’s pen set and some page flags in the next slot, followed by a couple of ink bottles (Gypsy Rose Deep Ocean and Noodler’s Raven Black). You can also see my glass pen sitting in the pen rest built into the shelf. On the right side you can see another ink bottle (Waterman Inspired Blue) and a resin stamp box in the shape of a stack of letters. On the top shelf is a notepad and a tin model of a typewriter. Behind the typewriter is an amethyst. The drawers contain various office supplies that are small enough to fit in them, like post it notes, page flags, paper clips, scissors, etc. Finally I have a blue leather pen case and my ampersand paperweight on the desktop. And that’s my writing desk. I try to keep the surface clear so I can write whenever I want, and keep my computer desk covered in the latest project, either work or home related. So far it’s working out really well. I hope you enjoyed this quick tour of my desk, and thanks very much to those who gently encouraged me to make my choice of the next journal (or as it turns out, journals) that I will be using. Happy writing! I wanted to write a quick message: I am still here! I am sorry for the empty field that is my posting of late. I have lots of ideas and little time it seems. But I am working on it. I know I’ve been saying that for months (!) but it’s true. I am just finishing up one of my journals – the Franklin Christoph Notebook – and I am trying to decide which journal to move into next, as my daily journal. I started the Stone Journal for the ink display with the glass pen but I’m not sure about it being a daily journal. Is the time right to jump into the William Hannah Notebook? I’m intimidated by it’s beauty but drawn to it every day. Or maybe into a rough and tumble Eccolo? Or a cheaper (so less pressure) Staples special? Or my beautiful dragonfly journal? Wow I’ve had that one for two years now and haven’t written in it yet. So many to choose from. I need something to write in tonight so I will open myself to my journals and one will choose me. This weekend I will let you know which one. Happy journaling everyone.